I finished this quilt in May for my Mom and with everything going on with my parents moving and a new grandbaby this summer, I haven't finished the quilt I started in August. Since the quilt was late for Mother's Day, I was thinking about giving it to her on her birthday this month. Well, she is moving next weekend and to save her having to pack the quilt, it is now a house warming gift. I will give it to her in early November. The quilt was a long time in the planning stages. I found two sets of 6 fat quarters a few years back when I was in grad school. The colors are my Mom's favorite and she has decorated her new house around them. I purchased the fat quarters with the Yellow Brick Road quilt pattern. I really thought I would make that quilt but the design didn't seem to settle well with me for my Mom. The rail fence design spoke to me and I completed the top with very few scraps remaining from the fat quarters. 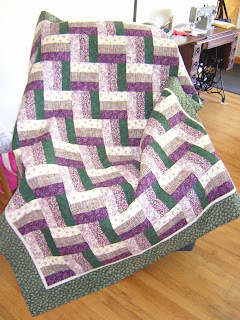 If you want to see the quilting details, check out my entry for May 2009. And if you want to see why I haven't didn't get a quilt made this summer, check out June and July entries on the 4-H quilting camps. The kids deserve an look for this online quilt festival. Nice very much the quilt. It is gorgeous and I love the colors! Nice colors! I hope it looks spectacular in your Mom's new place. ; ) She must know how much love is stitched into it!!! Thanks for sharing.